Going to our nation's capital on the 4th of July has always been on my bucket list. How cool is it to experience the fireworks on the anniversary of our nation's independence, in the town that hosts all the amazing things that show how far we've come. 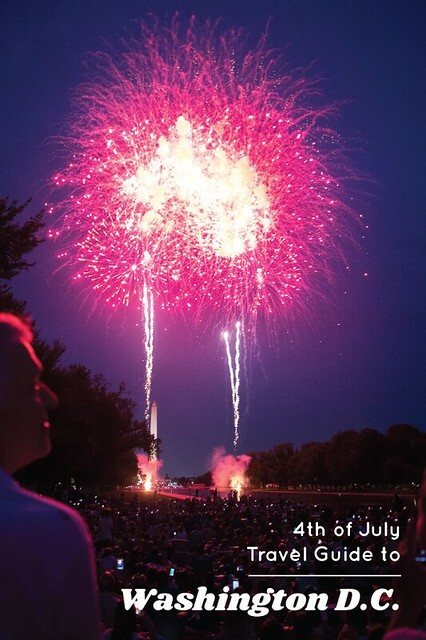 Here's a few tips on getting around D.C. on the 4th and the fun things you can do and experience - most for free! I wanted a front row seat to the fireworks, so I knew I'd have to stay overnight. I booked a hotel only 12 minutes from the Lincoln Memorial about three weeks out from our stay. There were still a bunch of available rooms at a really affordable rate. The State Plaza Hotel is located right within the George Washington University so it's a very welcoming and safe place to stay. The only issue we had throughout our whole trip in D.C. was a fight that broke out at Whole Foods between college kids! I'd definitely recommend the hotel & will be back to do a sunrise shoot in the future. One thing to note is that they do charge more per person staying in the room, but not much. My aunt lives in Baltimore so we were lucky enough to have someone bring us to the outer metro station in Greenbelt. We knew with the parade goign on a lot of roads would be closed and valet parking was $45/night, Yikes! So we opted for the $5 metro ride ($10/roundrip) We took the Green Line to Branch Ave and got off the french station (what we called it since it was a weird name: LENFANT PLAZA) then transferred to the Orange Line to Vienna and got off at Foggy Bottom. From there it was only a 3 minute walk to our hotel, easy peasy! Since our hotel was only a 12 minute walk to the Lincoln that's where we decided to go. I had read recommendations to go down early to nab a spot, but since it was so hot we opted to hang in the hotel until around 8:00pm. It was so packed with people! The army/navy & other officials did a really great job fencing the location so everyone had to go through a security check point. The line was long but it went really fast. They even had first aid people walking around with all kinds of things. We sat for a while but opted to stand in a walkway with a better view of the Washington Monument. The fireworks were by far the best I've ever seen. They lasted for a good half hour. There were so many in the finale that the smoke from the fireworks was blocking the view of the new ones. We were also so close that some of the debris was falling on us. With everything going on in our country right now it was really great to see everyone together just enjoying the 4th of July. HORRAY U.S.A.! The first thing we tried to do was see the White House. I'd seen it back when I was in middle school, back when you could stand directly in front of it. I thought it'd be a long shot that they'd let you see it and I should have listened! They had the whole road blocked off and you couldn't see it at all. From there we took the metro over to the National Mall to avoid walking in the 100 degrees. We came out of the metro station right to the Ronald Regan center. It was so hot we were looking to go anywhere to cool off. We had to go through security, which was no big deal. The coolest thing about the center was that they had a piece of the Berlin Wall right next to security. I'm not sure if it's always there or if it was on loan, but I've always wanted to see it and I had! This blog post is really cool round up of all the place you can see the Berlin Wall (bathroom in Vegas!). The center is really just for events, but they have some older flags hanging by the gift shop that was really cool to see. Worth it? On a hot day, yes for sure. You get to cool off and realax, not to mention there's really no crowd. The Berlin wall was a plus. If you're short on time, I'd skip it. Last time I was in DC I didn't get to see this, so it was top on my list. We had a short 10 minute wait in line. The museum was good but I was expecting more. The large elephant in the big observation room was really cool to see and the hope diamond was also on display. I think it would be a great place for kids or people who are really into animals. Worth it? Yes if you have kids. Could pass if you're short on time. How cool is it that you can see the document on the anniversary of when it was signed?! We wound up waiting in line for a short ten minutes at 4:40 on the 4th of July. I'm so glad we got here late because it wasn't busy at all. We shot directly to the main room where the Bill of Rights and Declaration of Independence is house. You're not allowed to take pictures anywhere in the building - expect the gift shop! They had a rosary desk on display and I asked if it was okay to take a picture. The set up of the large viewing room isn't the best but I still got a quick glimpse, which was really cool to see - and super faded! Worth it? YES! Especially on the anniversary. This was my favorite stop in all of D.C. President Lincoln was such a great man that I just got warm fuzzy feelings walking up and seeing it. On a cooler day, I could just sit off to the side and do some sketches. The other cool thing about the Lincoln Memorial is that airplanes fly over it about every 5 minutes. It makes for some really cool shots! I didn't get a chance to see this up close since tours in it are currently suspend due to updates. Looking at it from the Lincoln Memorial was awesome enough and no extra time. On our way over to the Holocaust museum we stopped at the Martin Luther King Jr. Memorial. It's such a beautiful statue of him and I loved that it wasn't finished. The artist did a really great job. All around the site was his I have a Dream speech. We were running short on time so I didn't get a chance to walk all the way around to see the whole site, so I'll be back again. In front of him was two signs that let people write on them, "What makes you feel independent?" It was fun to read all the answers. Across the pay you could see the Jefferson Memorial. While we didn't have time to go see it up close, it was great to admire it from afar. This is the only photo I took there. You're totally able to take as many photos but I was so engrossed in it all that I just didn't want to. I reserved tickets online for only $1. Something I found out after the fact is that on Wednesday & Thursdays at 11am they have survivors come and share their stories in the museum. If you're going to be there on either day, try to reserve a slot at 9:30-10am so you can get through the museum & still have time to listen. You choose a card before you take the elevators up to the 4th floor to start the tour. The card depicts someone who was in the the holocaust and you can take it with you. Then you get in an elevator and the guide tells you that you're going to watch a short video clip and when you walk out you'll see what the American soldiers saw when they encountered the camps for the first time (to liberate the prisoners). You step off the elevator and see the big image above of the bodies in a burnt grave. I'm pretty sure I whispered "Oh My God". It was such a somber enterence . The rest of the museum was laid out so well and I learned so much more than what I thought I knew about all that happened. My most powerful take away was that you walk through one of the rail cars that the Nazi's crammed all the jewish people in to take to the camps. It was so eerie to step into it knowing all the struggles they went through. Worth it? Hell yes. Just go. There's so much more to do in Washington D.C. and I'll be back to check them all out (sunrise photoshoot, Arlington Cemetery, White House, more Smithsonian Museums..). Fun tip: Angela Pan wrote a book, Snap DC, of all the best places to photograph DC - it's a great read. And sometimes she organizes meet ups to do midnight/sunrise/sunset photogroup sessions. Watch her Instagram for when the next one is.